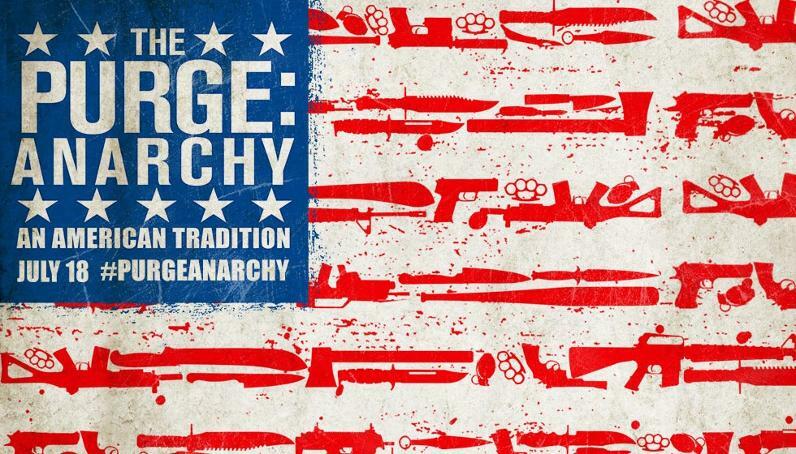 The Purge: Anarchy is a sequel to last year’s low budget hit The Purge. For those that have never seen the original The Purge is a once yearly event where for twelve hours anything goes. Crime in the USA in the future is at an all-time low and the government give the people one night of the year where they can have a blow out and are allowed to commit any criminal act, no matter how bad or illegal it is, with no repercussions. The Purge is credited with keeping the crime rate low for the rest of the year. The first film had Ethan Hawke and his family fighting for their lives as they tried to stop a gang from getting into their home. The Purge: Anarchy steps it up a gear and moves the action onto the streets of Los Angeles. What we have this time feels a bit like a slasher flick as a group of strangers who for various reasons are stuck out on the street after the Purge starts fight for their survival as they are attacked by people who are participating in annual The Purge. The sequel is scary in a part however there is something morally that doesn’t sit very well with the whole violence for violence sake story line. The Purge is an excuse for the rich to exterminate the less fortunate sections of society, the poor, who mostly all seem to be of an ethnic minority are nothing better than sport for the rich upper class. God help you if you’re sleeping rough as you’re not liable to be around when the sun rises in the morning. If like films that contain mindless violence then The Purge: Anarchy could just be for you. This is the second film in the series and it certainly won't be the last and it will be interesting to see in what direction the story goes from here.